Jungle Vista was an amazing place to stay with a great, chilled and friendly atmosphere, lots of different activities to do or even just a place to chillout and relax. Location is great just outside the jungle and you do get the feeling of living in the jungle with the open dorm... Swimming at the local lake was something different and it had an amazing view... I would definitely recommend this place to everyone. 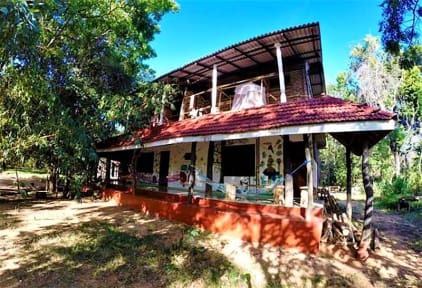 I really enjoyed the family atmosphere of this backpackers hostel were one will find everything to share good moments with other guests : plenty of game, a Yoga Shala , a fire space, good cooking and all the facilities to move around. The hostel is located in a lovely place at the border of jungle and rice fields which offer wonderful landscapes for sunset and many sites to discover. Special thank to Craig for the wild hike we shared on a lonely rock nearby ! Highly recommended ! Had such a great time at this hostel I originally booked for 2 nights but ended up extending because I enjoyed it so much. The food was always very nice and the portion sizes were pretty big, they had plenty of trips on offer making it very easy to do as much or as little as you want. The staff helped make it a very relaxed and enjoyable atmosphere. The outside dorm room was amazing being able to fall asleep watching the fire flies around the room. Had the best time in jungle vista! This place is so authentic and really makes staying in the jungle an amazing experience! It is a very socialable hostel and goes above and beyond to facilitate any trips you want to do from there! The staff were very friends and very accommodating to any needs and the food was sensational! Will definitely go back if I’m back in Sri Lanka!! Papa the owner is awesome! The dinner each night was great and healthy food. The staff were really nice! The atmosphere could have been enjoyable, but you’re swarmed with mosquitos with no coils, candles or any repellent aside from staying in bed under your net. Everything extra comes with a charge and it’s quite expensive. Breakfast is bleak- 3 baby size pieces of fruit and half toasted white bread. Only one small cup of tea, coffee costs extra. Too far from Sigiriya for convenience and the ride they offer is more expensive than a local tuk tuk (?!). Stay in Sigiriya. The first impression was good, but suddenly it was clear that the stuff could not handle all the guests. Dirty rooms with allot of flies and mosquitos. The internet was very slow and the main staff was very unfriendly and tried to add taxes to the booked price. No go!